« The Scroll of Esther and Hag Purim: Disturbing history or dramatic literature? According to Lev. 23:15, Jews are obligated to count the days from Passover to Shavu’ot. This period is known as Counting the Omer. In the days of the Temple, an ‘omer’ of barley was cut down and brought to the priests as an offering. The grain offering was called an ‘omer’ — thus the name of this period. Once the newness wore off though, I was back wondering what it all means. What can I walk away with from this exercise? The “traditional” answer to this question is that the counting is intended to remind us of the link between Passover, which commemorates the Exodus, and Shavu’ot, which commemorates the giving of the Torah. It is supposed to remind us that the redemption from slavery was not complete until we received the Torah. But, as someone who cannot accept this “traditional” meaning of the holiday of Shavuot (and I say “traditional” in quotes because the oldest meaning of the holiday of Shavu’ot was as an agricultural pilgrimage festival — not the day Moses received the Torah on Mt. Sinai), this explanation for the Omer isn’t particularly meaningful. What I have found meaningful instead, however, is using the Omer as an opportunity for inner reflection. A variety of writers have come out in recent years offering interpretations of the kabbalistic (mystical) interpretation of the Omer. 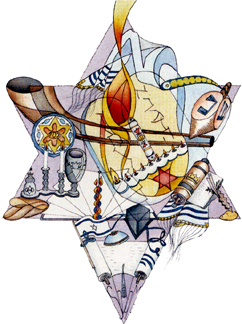 In kabbalah, each week of the Omer we move through one of the seven lower sefirot (emanations of God that are associated with a particular divine quality.) So, for example, we would focus the first week on the sephira of chesed (lovingkindness). Week two would be the sephira of gevurah (strength). This blog post by the New York Jewish Culture Examiner offers a helpful guide. The question becomes, in what ways do we experience or manifest the holy qualities of lovingkindness or strength in our day-to-day life? In what ways can we strive to experience or embody these manifestations of holiness? One book on this topic is Counting the Omer, a Kabbalistic Meditation Guide by Min Kantrowitz. Another beautiful practice you might consider adopting is to finish your daily Omer recitation by singing Ana B’Koach. On neohasid.org, you can find several recordings of this traditional and haunting melody. I like the Rami Shapiro omer journal – have you seen that? I have it as a PDF I think. Also who doesn’t love the Simpsons Count the Omer with Homer? I have been making my own omer counters of various kinds for several years – including one based on an advent calendar design and one using 7 pill-minders. Thank you for your broad, clear, and gentle introduction to counting the omer. I’m far from being Orthodox, but when I got the Orthodox Artscroll siddur and turned to the omer-counting section, I was delighted to see “Ana B’koach” after the actual counting, because I know an alternative chant for the first line that I love singing. Now I’m going to check out the traditional melody–thanks for the link! Continuing in the Artscroll siddur, after Ana b’koach I saw the long, very kabbalistic prayer that completes the daily omer count. Once I had retranslated it (because Artscroll translations are not my cup of tea) I was blown away. I used to have trouble seeing how the two sefirot for each day’s number in the omer count applied to me. But now, when I read that prayer, the kabbalistic element means something to me. For example, last night we counted day 6 of the omer, yesod of chesed. Now, I know yesod corresponds to ego and libido, and chesed means loving-kindness, but how does that combination apply to me? Well, in the prayer after Ana b’koach, I ask that any blemish I have caused in yesod of chesed be corrected. Okay, sometimes my ego does interfere with the flow of loving-kindness. I’m happy to pray for that to be corrected. And then I get to pray that I may be made more holy through the flow of divine abundance. For me, this is a wonderful practice!